The AS3104T provides home users with a storage solution featuring optimal value, comprehensive functionality and multimedia entertainment. The 4 disk-bays provide high capacity storage, allows users to store and preserve their most valued digital assets in original high definition versions. AS3104 is powered by Intel Celeron N3050 Braswell dual-core processors, equipped with 2GB of dual-channel memory, and feature read speeds of over112 MB/s and write speeds of over 112 MB/s under RAID 5 configurations. You no longer need to worry about running into resolution compatibility issues when playing videos on your phone, tablet or computer. Media Converter utilizes a quick and simple conversion method, allowing you to execute conversion tasks in the background. The exclusive built-in Hyper-Transcoding technology was expertly crafted by ASUSTOR. This technology utilizes the Intel CPU hardware acceleration function to make video file conversions faster and simpler than ever before. Using Hyper-Transcoding to convert video files can reduce the normal conversion time by at least 10 times. The AS31 series devices redefine the aesthetics of a NAS. The stylish diamond-plate finished cover makes it an elegant addition to any space, no matter if it is a family room, living room or office. 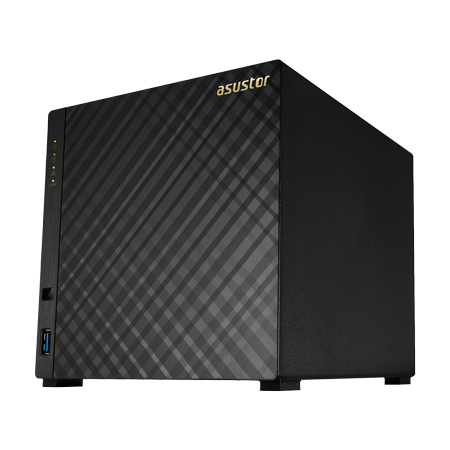 The AS3104 provides a large capacity NAS for home users at an affordable price. Users can install four 8 TB hard disks to immediately create a high capacity storage space of up to 32 TB. When taking photos or recording videos of family vacations, gatherings and other cherished memories, users no longer need to be confined to the limited storage on memory cards. With high capacity AS3104, users can save all of their videos and photos in high quality resolution, preserving them perfectly. Additionally, RAID 5 and 6 storage volume setting provide comprehensive protection for all digital assets stored on the NAS, minimizing the risk of data loss due to hard disk failure or accidents.